The top two teams in the Class 2 District 6 tournament had only suffered one loss on the season and fans knew it would be a tough battle. 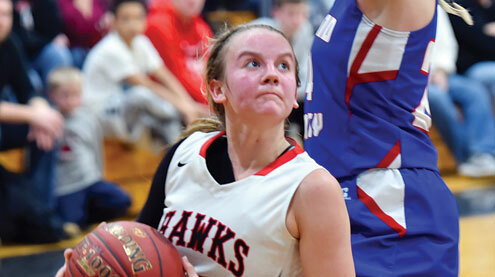 Despite a never quit attitude, the top-seeded Clopton Lady Hawks were defeated by (2) Scotland County in the district championship game on Saturday, 59-46. The Lady Hawks got behind by eight points in the first quarter but kept battling to trim that to six by the end of the period. Scotland County kept Ashtyn Lagemann out of the scorebook in the opening period so the Lady Hawks turned to Emily Brune who drained a pair of three-pointers and a bucket for eight points and Cassie Brown hit two free throws. Scotland’s Caleese Bair drained a pair of three pointers as well, along with a couple of buckets and a couple of free throws in the first quarter for 12 points in the first quarter. Clopton outscored Scotland in the second quarter 13-11. The defense managed to shut down Bair and Lagemann was able to put four points on the board. Brown knocked down three buckets and Kaitlyn Kuntz got a basket in the frame. The Lady Hawks cut the deficit to four points with the score 27-23 at halftime. Clopton generally shines in the second half of games with their suffocating defense but Scotland County kept finding answers. The Lady Hawks were held to just four points on a pair of baskets by Lagemann in the quarter as the Lady Tigers notched 14 in the third for a 41-27 lead going into the final frame. Clopton never quit and battled to the end, but wasn’t able to find an answer. The Lady Hawks edged Scotland in the final quarter 19-18. Kuntz fired up a couple of three-pointers and Jillian Lockard recorded nine points in the quarter. Scotland County largely made their free throws down the stretch. They were 10-14 in the fourth quarter from the charity stripe and 18-24 for the game. Clopton was just 50 percent from the line (7-14) for the game. Kuntz was the only player to hit double-digits and was named the Community State Bank TribCast Player of the Game. Scoring for Clopton: Kuntz, 11 (5 rebounds, 3 assists); Lagemann, 9 (11 rebounds, 3 assists and 3 blocked shots); Lockard, 9 (1 rebound, four steals); Brune, 8 (2 rebounds, 1 steal); Brown, 8 (4 rebounds, 1 steal); Kassie McGuire, 1. Bair led Scotland County with 25 points. Coach Larry Lagemann pointed out that it was an unfortunate end to a great season. He added there are high expectations every year and a district championship is also expected every year. “This was the 15th year in a row our girls have played for a district championship, and we have won 11 of them during that span. There is not a girl in our school who has ever known a Clopton girl’s team that did not play for a district championship. 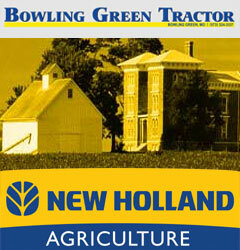 That is hard to believe,” Lagemann asserted. It was the first home game this group of seniors had lost since they started playing together in seventh grade. “That is quite an accomplishment, yet at the same time it makes the loss that much harder to take,” Lagemann noted. The team will lose several seniors to graduation including starters Ashtyn Lagemann, Emily Brune and Kassie McGuire as well as Katie McCrory, Cassie Brown, and Tori Werkmeister. Lagemann has been coaching for 22 years and picked up his 500th win with the Bowling Green Tournament championship victory. He noted that he plans to take a week or two to evaluate himself, the program and the demands/needs of family and being a pricipal before decided to take on another year of coaching. The Lady Hawks marched past South Shelby in the semifinal on Wednesday, 63-40. Emily Brune broke loose for 11 of Clopton’s 19 first quarter points. The team also got a couple of baskets from Katie McCrory and two points from Kaitlyn Kuntz and Ashtyn Lagemann. Clopton held South Shelby to just nine points in the opening frame to kick off the game with a 10 point lead. The Lady Hawks outscored the Lady Birds 16-11 in the second as Kuntz drained a couple of three pointers and Lagemann notched three buckets. Clopton had a 15-point advantage by halftime, 35-20. South Shelby came out of the locker room on a mission and inched their way back in the start of the third, but Clopton came back fast to end the quarter ahead by a point, 12-11. The Lady Hawks got three pointers from McCrory and Kuntz in the third along with another pair of baskets from Lagemann. Clopton put the game away with a 16-9 fourth quarter as the team got points from four different players including Kuntz, Lagemann, Brune and Calynn Lockard. Brune led the way with 21 points, three rebounds, three assists and a steal to earn the Community State Bank TribCast Player of the Game. Lagemann notched a double-double early on in the game and ended with 18 points and 13 rebounds, three steals, three blocked shots and an assist. Other scoring for Clopton: Kuntz, 15 (6 rebounds, 4 assists, 7 steals), McCrory, 7 (3 rebounds, 2 assists and a steal), Lockard, 2 (one rebound). The Lady Hawks picked up a dominating 85-27 victory over eighth-seeded Louisiana inthe opening round last Monday The game was reported on in the last edition of The People’s Tribune and can be found in the archive. Find the games in the TribCast archive along with photo highlights online at www.thepeoplestribune.com. 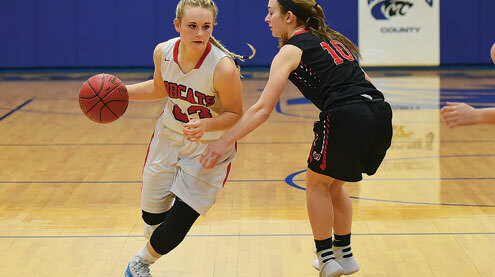 The Lady Cats opened strong in their district semifinal against North Callaway, but the T-Birds came back to end Bowling Green’s season 57-42 on Wednesday. The Lady Cats outscored North Callaway 17-4 in the first quarter as senior Alyssa Starks and junior KateLynn Charlton each scored six. Charlton added three more points in the second quarter for Bowling Green, but turnovers limited the Lady Cats to just four total points. North Callaway had four different players notch points and the Lady Thunderbirds tallied fifteen points to pull within a field goal at the break. Charlton continued to score in the third quarter, but the lead vanished for Bowling Green. North Callaway outpaced the Lady Cats 23-14 in the third quarter and led 42-35 heading to the fourth. In the final quarter, North Callaway converted on 7 of 12 free throws to extend their lead and earn a trip to the District Championship game. While North Callaway had double figure scoring from four players, the Lady Cats had only one score ten or more as KateLynn Charlton finished with a game high 18 ponts to earn the Community State Bank/TribCast Player of the Game. North Callaway fell in overtime to Lutheran St. Charles in the title game on Friday night. Scoring for Bowling Green: KateLynn Charlton, 18 points; Alyssa Starks, 8 points; Gabi Deters, 6 points; Jaylen Early, 5 points; Kara Meyer, 3 points; Kinley Charlton, 2 points. Scoring for North Callaway: Kenzie Ausfahl, 16 points; Nicole Emmons, 14 points; Allie Schlueter, 12 points; Kyla Bertschinger, 10 points; Samantha Schaefer, 5 points. Bowling Green said goodbye to senior starters Alyssa Starks and Kara Meyer as their season came to an end with a record of 18-9.